I love questions like these, because it means they are usually very open to advice and wanting to do things right instead of demanding something like “SEO optimization”. We all start somewhere and in my experience it’s best to start by asking questions. It also made me think about what I would do if my only had ~$20k to spend on marketing for the year total, which is exactly what we had for 2016 and 2017. If I were you, I wouldn’t be looking for someone to do “services” for me, such as hiring someone to do technical updates, write content, build links, do continuous research, etc. Instead, I’d hire someone to put together an overall strategy for me. Since your business is an ecommerce business with ~1000 SKUs, from what I can see on the site, I’d be much more interested in the strategies behind getting your categories and products ranking. If I were you, I’d find someone who could do an audit of your existing platform and then put together the strategy for you for a couple thousand dollars. Then, I’d invest the time and money into executing on that strategy. If you’re looking for someone to do all of the needed things and you only have realistically ~$10k to spend this year on SEO (because paid acquisition should take up a large chunk of your budget), you’re going to need to spend your time budget moreso than if you had a much larger budget. This isn’t to say that you cannot then hire someone on a freelance basis to then operate some of these channels, such as your media spend, where you do not have the time or the ability to gain the skills to do it well, but starting off looking to hire someone cheap to operate is not the right way to go. First understand the strategy and the opportunity, then seek to fill that role. In fact, this is exactly how I operated Credo until mid-2017 when I began bringing in more consistent help. In 2016, I ran Credo very lean. We did ~$100k in revenue as I also consulted. Business was growing well throughout a lot of business and personal changes. I remember well sitting in a coffee shop in Hayes Valley between appointments working with a developer I found through Codeless on some Gravity Forms improvements. In 2017, I worked with a few consultants. I worked with a copywriting consultant for a quick audit and an hour of phone consulting as I worked through some messaging changes for the Credo homepage, and at the end of the year I worked with a friend who built a business very similar to Credo in the past on some technical recommendations and strategy for moving forward. 2018 is where I started to use services like Verblio (at the time Blogmutt) and my friend’s content company to actually produce content for us. I’ve also consulted with email marketing professionals and designers, and in the middle of the year I hired a Denver-based friend to partner on our redesign. In Q4 2018 I finally hired my first full time employee, and now my friend who did our redesign is also working with us half-time. We are also continuing to work with a few consultants and service providers on areas of the business. 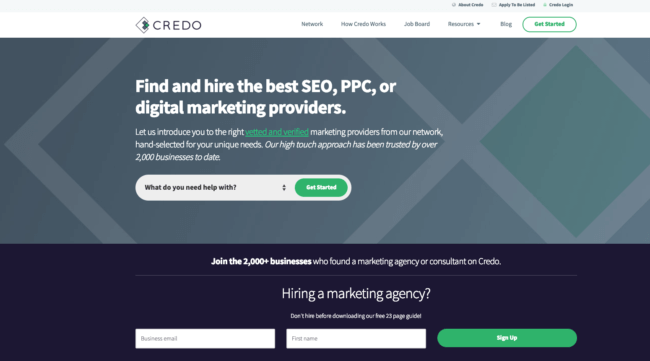 My recommendation is definitely colored by my own experience with Credo, but also from seeing many businesses with smaller budgets come in looking to hire someone for their needs without understanding what direction to run first in order to get the most return for their business. Invest in knowledge first, use your time budget, and then look to hire for the areas outside of your areas of expertise and passion.